Party Trays & Tins - Save By The Case! Home > Party Trays & Tins > Save By The Case! 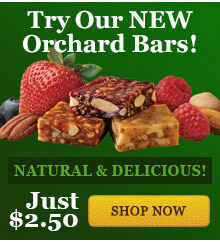 Sweet savings on Aplets & Cotlets or Fruit Delights by the case! 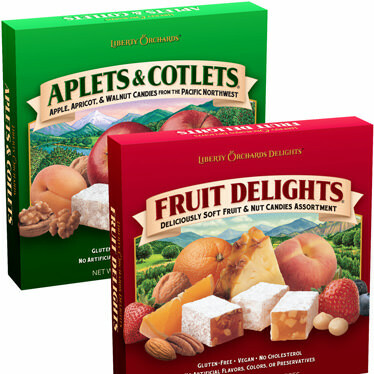 Choose from a case of twelve 10oz Aplets & Cotlets, or a case of twelve 10oz Fruit Delights, or a case of each, and save 15% per case! Kosher. Gift wrapping not available on these items. APLETS & COTLETS: sugar, corn syrup, walnuts, modified corn starch, fruit juice from concentrate (apple, apricot), pectin (pectin, disodium diphosphate, sodium polyphosphate, dextrose, dicalcium phosphate), natural flavors, sodium citrate, citric acid, malic acid, soy lecithin. FRUIT DELIGHTS: sugar, corn syrup, nutmeats (walnuts, pecans, almonds, macadamias, cashews), modified corn starch, fruit [fruit juice from concentrate (strawberry, peach, blueberry), candied orange peel, pineapple], pectin (pectin, disodium diphosphate, sodium polyphosphate, dextrose, dicalcium phosphate), natural flavors, sodium citrate, citric acid, malic acid, soy lecithin.